The design of the Simulink-based 2-degree-of-freedom (2-DOF) robot arm control workstation allows the user to interact with a model of the physical workstation outside of the laboratory setting. 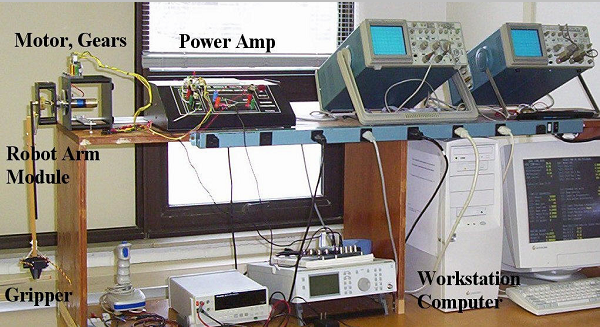 The experimental workstation consists of the robot arm system, power amp, joystick, computer, and several devices used to collect and analyze data. This is a continuation of a previous project done by Adam Vaccari and Kain Osterholt in 2004-2005. They modeled the robot arm with only one degree of freedom, excluding the rotary flexible joint from the software model. The new design includes a model of the second degree of freedom which consists of a mass- damper-spring subsystem. All additions to the model are based on data from the physical workstation using the software packages: Matlab, Simulink, SimMechanics, Virtual Reality Toolbox, and Real-time Workshop. Several different controllers have been designed for the robot arm to enable greater precision and speed. A graphical user interface and a virtual reality workstation have been constructed using the software packages in order to enable the user to interact with the simulation in real-time. After the project is completed, control theory students will be able to use the robot arm control workstation for homework problems and design projects. Students can gain a better understanding of the theoretical concepts by testing their designs on a workstation that closely mimics the physical system. The control workstation can also be used by graduate students as a platform for advanced controller algorithms such as those used in artificial neural networks.